Are you interested in making money from cryptocurrency trading? Are you annoyed of keeping a track of multiple orders on innumerable exchanges? If you resonate well with these concerns, you are in the right place. If you don’t, stick with us as we are going to unveil something very interesting, something that can help you maximize your profits in the cryptoland. On observing closely, you will find that the cryptocurrency market is hyper-volatile, to say the least, but this volatility can actually be used to earn handsome profits if you have the right tools. Improper/less effective stop losses or take profit features in the exchange UI. Lack of real-time notifications etc. These are just a few of the many problems or limitations that they face. Hence, their trade quality isn’t good enough to realize maximum profits. However, 3commas is revolutionizing that. Let us understand how! 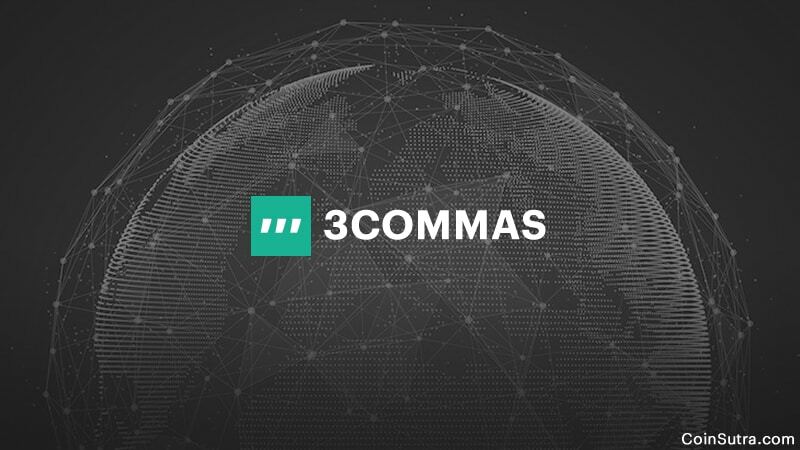 3commas is a cryptocurrency trading bot that helps improve the trade quality by giving the trader the right control and features they need to maximize their cryptocurrency trading profits. 3commas calls it SmartTrading. In the SmartTrading approach that is implemented via the 3commas tool, you get some exclusive features. Now that you know about these features, it makes sense in introducing you to its interface and also throw some light on each of these features. When you register on 3commas with your email ID, and login for the first time, you will see this as your dashboard. Here, you can keep track of your balance, prices and other quick access feature like ‘Connect to exchanges’. Note: When creating API for any exchange, make sure to not enable the withdraw feature. This is already mentioned in the 3Commas article but something I feel it’s important to mention. Make this a thumb rule whenever you are using a Crypto bot. Here is an example: Let’s say you want to buy a coin and your entering price is $X. With 3commas, your order will actually be placed on your chosen exchange when the 3commas bots detect that your buying condition is met. Unlike traditional exchanges/bots, it will not create fake buy/sell walls. Similarly, when stop-loss has to be activated, it will constantly look out to check if the conditions set by you actually match at that time. In both these ways, your actual funds will never be waiting for the conditions to be met and will not be frozen in the exchange itself. 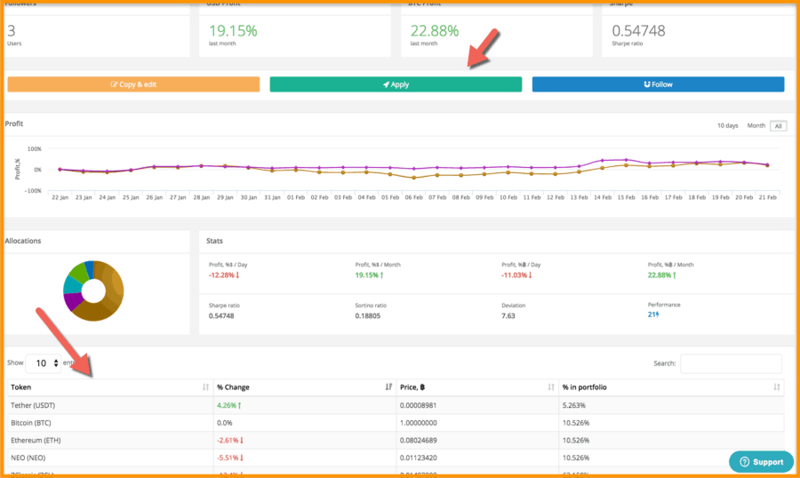 And as soon as the coin price coincides with the condition that you set (for example take-profit), the bot will close the position, i.e. it will take the profit. Trailing Stop-Loss: For example, you buy 1 ETH for 0.05 BTC, and set in the system a stop-loss goal, for example, 10% (0.045BTC) and take profit is 20% (0.06 BTC). The trailing stop-loss always follows the price and moves the stop-loss after the price moves toward the target take-profit. For example, suppose the price of ETH increases by 10% (0.55 BTC). Now your stop-loss of 10% will be rearranged to 0.0495 BTC. To understand more about how trailing stop-loss feature works see this official guide from 3commas. 1. You open a position at a price, for example, $5. You set take-profit to $6. The TP condition itself means that when the price reaches $6, your position will close, and you will earn $1. 2. Trailing take-profit is needed to maximize profits, that is, if the value of the position increases, it won’t close it at a fixed price, but will raise the closing condition while the value goes up. If you bet Trailing TP to $7 (40% of the growth from the initial one), while the price goes up – $6 (20%), $7 (40%), $8 (60%) – the closing position changes and the take-profit grows. 3. At a time when the price goes down more than X% (which you choose in the settings), the position closes. If this happens, for example, at $9 dollars, you will additionally earn $3, thanks to trailing take -profit. To understand more about how the trailing take-profit feature works, check this official guide from 3commas. You can also enable notifications for mobile, in the browser, and emails from the right top corner under settings here. You can also customize the type of notifications you would and would not like to receive. 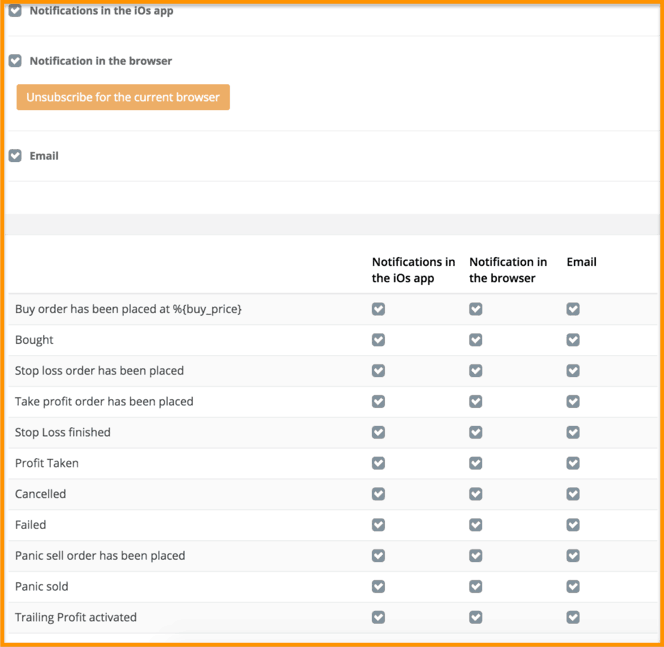 You can also add notes/comments in your trade orders so that you can recollect or can get its audit trail in the report itself as to why and when you the trade was carried out. You may also add comments like ‘you want to hold this coin for next 6 months’ to trade efficiently through 3commas. Trader’s diary is another cool feature of this tool where you get a consolidated report of the trades that you have made on all the linked exchanges through 3commas. You will also understand at a glance, by looking at this diary, the profit or loss you have incurred on a particular trade in a particular duration. You can also explore portfolios of others through this tool and analyze how they is doing by following that particular portfolio. 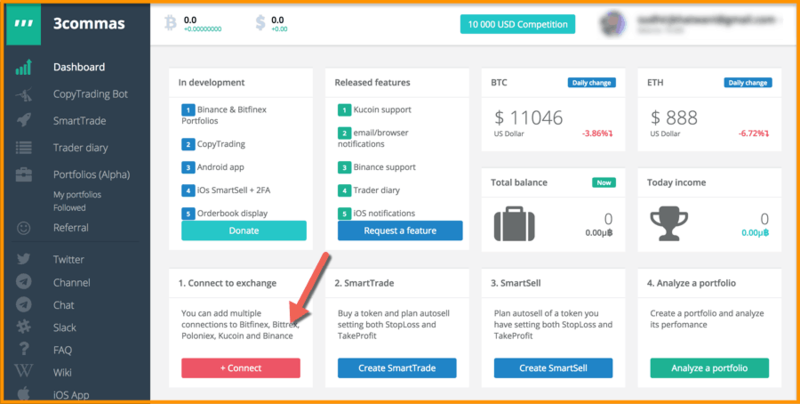 You can also copy a portfolio if you like, but for this feature to be used you should have those particular exchanges linked to 3commas. 3commas is rather cheap for the features it provides. It cuts down on a lot of hassle for multiple exchange users. A commission of 0.25% on the transaction amount is charged for each Smart Trade (Buy) or Smart Sell (Sell) created. The use of infographics and portfolios, automatic balancing, in particular, is completely free on 3commas for now. Note: The service charges the commission from your internal account, not from your deposits on an exchange. Also, you get a joining bonus of $10 in your 3commas account when you register on it for the first time but this $10 is strictly to cover their commissions and you can easily test a volume of $4000 from the amount. 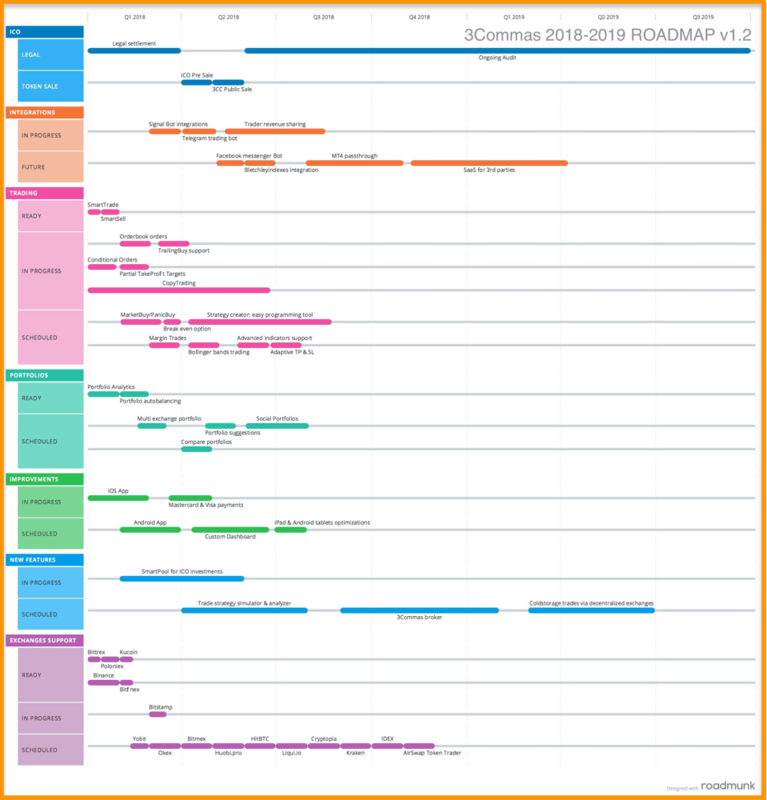 Looking at their roadmap, it is not difficult to say that the development team seems serious about what they are developing. Also, it looks very evident that they are doing something that no one else is doing in the industry as of now. Also, there is a flurry of more exchanges such as Bitstamp, Yobit, Bitmex etc that they are going to add in the future. Option to copy winning traders via their CopyTradingBot feature which they also call as social trading is just amazing. 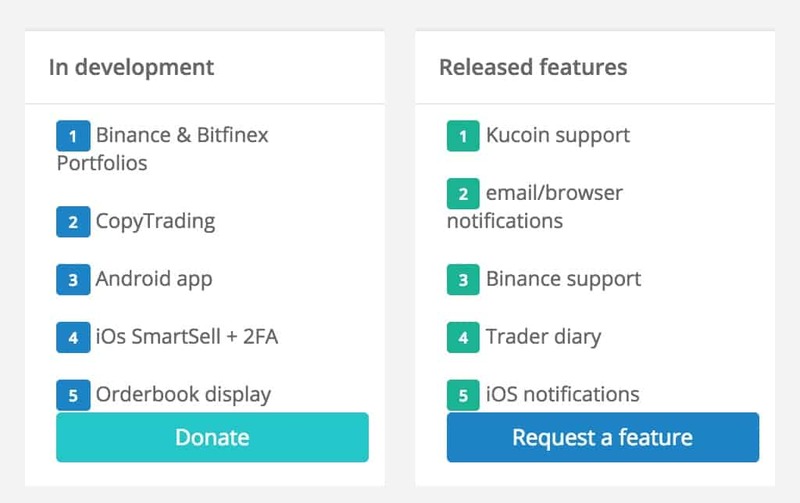 With other features like order books, new exchanges, copy traders etc that are upcoming, it will only make this product more useful in the coming days, also keeping in mind that the entry barrier of 0.25% fee is also very nominal for most of us. That is all from my side in this introduction of 3commas. If you liked the idea, go ahead and register on 3commas to start trading. I hope this detailed analysis and review of 3commas helps you in making a good decision. Share your experience with us in the comment section below! I really like the idea of Crypto trading bots as they help in making a better decision and some time makes it easier to do trading. However, in no condition ever imagine that a bot will automatically make money for you. Spend time learning about the features and these bots will make your trading fun and easy. Now, go ahead and make some money! Do come back and share your review of 3Commas and let us know if you are using any other Crypto trading bot and your experience. Really very happy to say,your Blog post is very interesting to read.the techniques you are described are also very useful.thanks for sharing information. Enjoyed reading the Blog above , really explains everything about Cryptocurrency in detail,the Blog is very interesting and effective.Thank you for shiring information. Is 3 commas safe? Has anyone had a bad experience? I have been using 3commas for a long time and had no issues. It’s trustable!